Do you want your kids to eat healthier? Do you want to turn out delicious meals for your family, without spending a lot of time in the kitchen? If you have thought about the answers to either of these two questions, joining Shallowbrooke Farm CSA may be an ideal thing for you and your family. 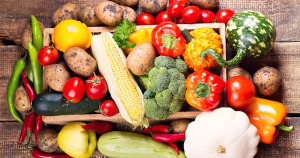 A CSA is a program offered at the grass roots level of farming, where a small farm will sell subscriptions to their fruit and vegetable harvest for the season. 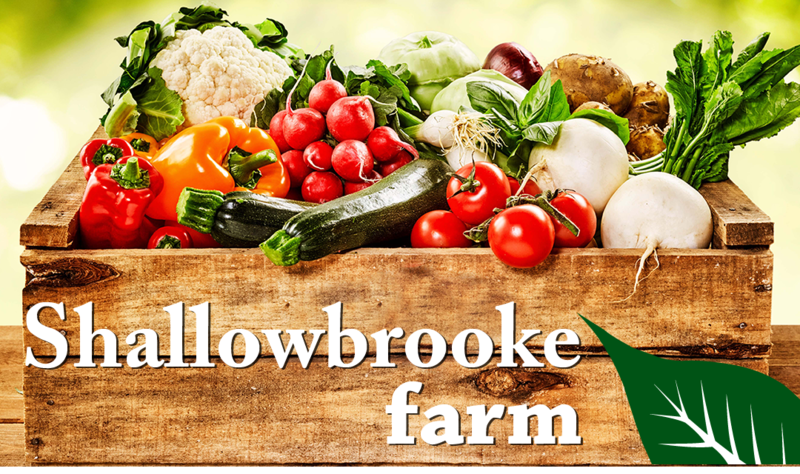 In the case of Shallowbrooke Farm, they offer a 20 week season CSA that delivers fresh fruit, vegetables, meat, poultry, eggs, and milk directly to your door. Their products are ultra fresh and are often harvested within hours of delivery. We have been delivering our products via the CSA model for a decade. 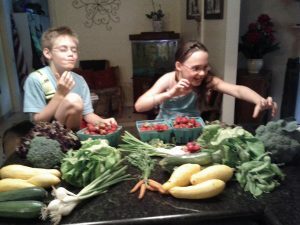 There are certain trends that magically happen when a family joins our CSA. We have heard it over and over again. “My kids love bringing in our box each week and they are excited to see what is inside. It’s like Christmas in July.” Mothers all over northern Virginia have been pleasantly surprised by this side effect. The CSA suddenly became a pathway for mothers to broaden the scope of their children’s diet. The children are excited to try the new fruits and vegetable that arrived at their door. In fact they are so excited about it; they forget they won’t try broccoli or whichever vegetable that was previously hated. Here is your chance mom, what a great way to get the entire family eating healthy, and in addition simplifying your time in the kitchen. I personally love cooking when our gardens are in production. The meals are much easier to prepare. I know many of you are scratching your head. How can cooking complete garden produced meals be easier? I will share with you the answer. Our parents and grandparents prepared awesome meals with ingredients fresh from the garden.. That generation knew that cooking with garden fresh produce was easy. Fresh vegetables require little to no prep time and can be cooked in a matter of minutes, just as quick as microwave meals and immeasurably healthier. Steamed green beans, steamed broccoli, or sautéed summer squash are all sides that can be prepared in a matter of minutes. Made with garden fresh ingredients each side will be loaded with flavor and loaded with nutrients. Pair these sides with grilled chicken and in 30 min or less you have a dinner that will rival any restaurant for quality and flavor. There is a difference cooking with produce delivered directly from the farm, I believe that it is far more tender, and requires less effort to cook than the counterpart grocery store produce. You will need to experience the difference for yourself. Fresh fruit and vegetables delivered in season. There are many more reasons why one should consider the CSA program at Shallowbrooke Farm. These two reasons are overlooked, people are intimidated by scratch cooking with fresh vegetables. They are afraid that it will consume too much time or that it is difficult to achieve a quality result. I believe that both are untrue, and can actually simplify the life of the person preparing meals in your family. No one on our team ever thought that the kids in our CSA families would be the ones going bonkers over our products. That is certainly one side effect that we are very proud. Let Shallowbrooke Farm simplify your life this summer, Join Our CSA. Eat Your Veggies! Or at least store them properly.